I am involved in one of the over 36,000 farms in Saskatchewan. Now if you are like most folks, a picture or two will have popped into your head when you hear “Saskatchewan farms”. You’d be right in thinking that grain and cattle operations make up the majority of the farms in Saskatchewan. But there is so much more! When you’re young and growing up, it can be hard to grasp how big the world is. Where you live – your home, your yard and your neighborhood – is where your world begins and ends. As a child growing up on a farm, I felt that everything I would ever need was on the farm. That included the sandbox, the hay mow, and my bike. Some concerns have been raised that antimicrobial use in livestock leads to antimicrobial resistance and that some of the products used in food animals are closely related to antimicrobials that are important in human health. It’s also been questioned whether antimicrobial resistance can be transferred among bacteria, which may reduce effectiveness of drugs used in human medicine. Of course the Canadian beef industry is also concerned about antimicrobial resistance. Cattlemen depend on the effectiveness of animal health products, and on consumers’ confidence in how beef is raised and the safety of the beef they consume. And just like the rest of the society, farmers need human drugs to be effective too. We’re all in agreement on the seriousness of antimicrobial use and resistance. Several nations around the world have surveillance programs in place to monitor trends in antimicrobial use and resistance. In Canada, this is led by the Canadian Integrated Program for Antimicrobial Resistance Surveillance (CIPARS). In the United States, surveillance is conducted by the National Antimicrobial Resistance Monitoring System (NARMS). These programs test for antimicrobial resistance in healthy animals arriving at slaughter plants as well as retail meat samples. In addition, various groups including the Beef Cattle Research Council and Agriculture and Agri-Food Canada collect more detailed antimicrobial use and resistance information in a broader range of microbes and locations (e.g. feedlots, manure, soil, water). Resistance to antimicrobials that are most important in human health is extremely uncommon in healthy North American cattle and beef. Multi-drug resistance is similarly low, and is not increasing. In cattle, the vast majority of antimicrobials used are not used in human health at all. Let’s look more closely at the last point. The vast majority of antimicrobials used in cattle are ionophores. Ionophores act on rumen microbes; they selectively inhibit methanogenic bacteria and allow beneficial rumen bacteria to make more feed energy available to the animal, thereby improving feed efficiency and weight gain. Ionophores also prevent diseases like coccidiosis. Ionophores have no benefit to, nor are they licensed for use in humans. Even if microbes developed resistance to ionophores, this would not make them resistant to classes of antimicrobials that are used in human medicine. Eliminating antimicrobial growth promotants, including ionophores, in cattle production would substantially reduce the overall use of antimicrobials, but would that reduce concerns about antimicrobial resistance? Denmark phased out the use of those products in livestock production between 1994 and 1999. Since 2001, we can see a clear trend of increased use of prescribed veterinary antimicrobials. The decrease in antimicrobial use has happened in the “medium importance” category, antimicrobials rarely used in human medicine anymore. Without the use of growth promoting antimicrobials, the need for antimicrobials that are important to human health increased. 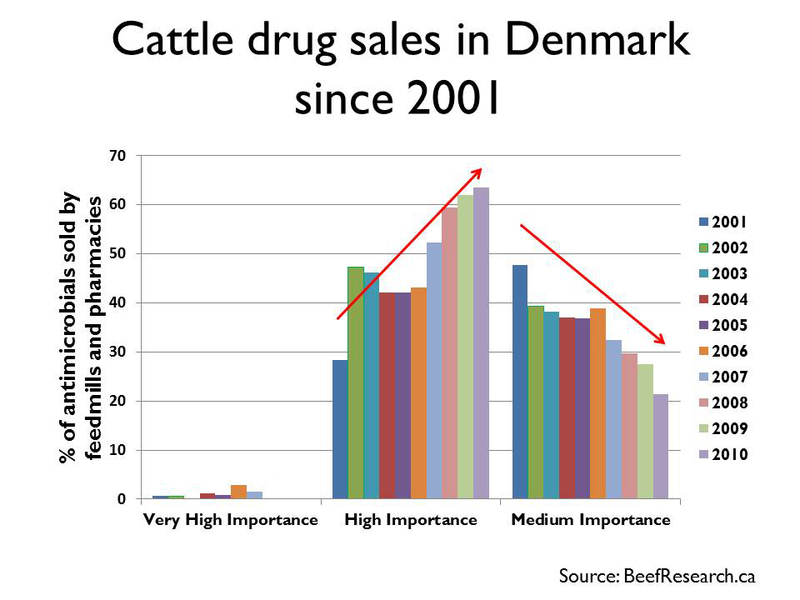 In addition, there has been no clear trend towards decreased antimicrobial resistance in Danish cattle or beef. Canadian research has repeatedly shown that antimicrobials are used responsibly by Canadian beef producers, and resistance to the most important classes of antibiotics in human medicine remains extremely rare in beef cattle. Antimicrobial resistance will continue to be a research priority in Canada’s beef industry to maintain or improve current prudence. Continued use of antimicrobials of no importance to human health in Canadian beef production will be critical to the future competitiveness of and reduced environmental impacts by Canada’s beef sector due to improved feed efficiency and reduced animal disease. Furthermore, the consequences of a ban on ionophores in Denmark suggest that discontinuing the use of such products would not lead to lower antimicrobial resistance, and may increase the use of antimicrobials that are important in human medicine. Since becoming involved with social media over the last year I have begun to take note of people’s attitudes, opinions and knowledge as it pertains to agriculture and food production. I grew up on a farm, attended an ag college and subsequently worked in agriculture so I’ve been surrounded by like-minded people my entire life. However, agvocating has opened my eyes to the realization of just how little the general public knows about where food comes from. It is fascinating (not to mention a little scary) to delve into the general public’s belief system and knowledge base in this area. To clarify I am pro conventional agriculture, organic farming and alternative production practices. I believe in new technologies and in providing the consumer with what they desire and believe there is room for multiple types of systems. It is surprising though at how little understanding there is of contemporary food production practices by the general public regardless of what type of system we discuss. Now, at every chance available I ask questions. Whether it is on Facebook, Twitter or in an actual real life face to face conversation (I know, how old school). This is not to be antagonistic, just to understand an individual’s perspective – and sometimes position – on food production and possibly to dispel some misconceptions or false information that seems to be endemic in the populous. I also ask so as to understand why and how they developed their beliefs. Where did we fail in our society that such a basic life necessity is so distanced from that of every other day to day need? A recent conversation of animal welfare versus animal rights included a discussion about what happens at a slaughter plant. Surprisingly I was asked if I understood what “actually” happens there. Now, I do not object even the slightest to someone’s choice of being vegan though I was thoroughly astounded about the question of whether or not I’d considered what happens at a slaughter plant. We raise animals to eat and with that comes the understanding that the death of those are animals are inevitable and it is our responsibility to be respectful of and honour that animal’s life. For this person the thought of that many animals dying on a daily basis was just too overwhelming and simply too much to bear so adopted a vegan lifestyle. Despite the intrinsically dark nature of animal slaughter it never occurred to me that this essential step in getting meat from the farm to the plate should come as a surprise to anyone. Stats Canada stated that almost a third of Canadians lived on farms in 1931 and in 2006 that dropped to 2%1. How did we go in one or two generations to be intimately involved in supplying our own food to now having so little idea as to be completely oblivious. And that is only going to become more evident in future generations. My cousin told me a few years ago that her young daughter wanted to take the “wrapping” off of her peas – she wanted to take the shell off the pea pod. If we are so distanced in garden vegetables how shocking must a barn filled with thousands and thousands of laying hens seem? So in conclusion, my friends, I offer no suggestions here. I only request that we all continue to speak out in an honest and respectful way. To seek out what really drives a person’s belief system so that we can help to dispel those myths and to continue to keep producing food in the best way possible. Because it is essential that our customers and our society understand what it means to do so. That we are not forced to do it in a way that would not be beneficial for our children, environment or our future. Today’s post comes to us courtesy of Sarah Shultz author of NurseLovesFarmer.com blog. When I read it I thought this to be an excellent message of keeping the “Agvocating” message positive and certainly worth sharing. If you want to see additional posts from Sarah please check out her blog! It’s been almost a year since I started writing about agriculture on my blog. Sure I had posted dozens of pictures during seeding and harvest times and blogged about our family farming life, but I hadn’t ever really taken the plunge into blogging about the business of agriculture. I started off by asking my Facebook friends if they bought organic food, and why or why not. I got a varied set of responses and asked my friend Lyndsey from RealAgriculture.com do a guest post for me as I knew the majority of my readers (moms of young kids) would be able to relate to her as she’s also a mom of young kids and a professional in the agriculture industry. I then had my farmer husband write a post on his thoughts on organic and non-organic food from a producer’s perspective. These posts received good feedback and gave me the confidence I needed to keep agvocating. It is like an emotional roller coaster with the highest of highs and the lowest of lows. A little background info to that is that in the late spring of 2012 in my mommy blogging world I came across a Twitter party which was a plight to get a baby formula company to be a leader in the industry by removing GMOs from their formula. It really bothered me that such fear was being spread among my parenting peers, so I attended this party in an attempt to try to be the voice of reason for agriculture and science, even simply as a farmer’s wife & mom. This would be the first time I was indirectly called a shill for agriculture when a participant asked me if I was being paid to attend this party. I had no idea what they were talking about and attempted to talk to these participants that GMOs were not harmful and that worldwide scientific consensus stated the same, but no one would listen. At that point I decided something needed to be done on my part because it was not right that so many parents were being lead astray thinking that they were causing harm to their families by feeding them “evil and poisonous” GMOs. This is when I started researching GMOs and how I could best agvocate and teach my readers about biotechnology in agriculture. My first post merely posing my reader’s questions for GMOs entitled “Do You Have GMO Questions?” received 136 comments, mostly from people of the anti-GMO nature. Immediately I questioned “what have I gotten myself into? !” as my anxiety shot through the roof at the negativity my blog was receiving. Cami Ryan, my mentor and now good friend, gave me lots of invaluable advice and many counseling sessions via email! Educating about ag when I’m not really in the industry is a challenge. On one hand I lose credibility as “just a mom” and blogger…but on the other hand a lot can appreciate where I’m coming from because I’ve taken the time to do my own research as a mom. I’m a farmer’s wife and I’ve learned a ton through my husband, people in the industry via social media, and mostly by reading articles and researching myself. Trying to maintain composure and confidence when it feels like most people are attacking and fighting back gets very draining on the nerves. If you want to agvocate or be a positive voice for anything you feel strongly about, I highly recommend having a mentor and joining some Facebook groups who talk about whatever your interest is. I’ve connected with a lot of other farm wives, farmers, and ranchers who blog and that are on Twitter that I know I can rely on for support and to help agvocate in the comments sections of my ag posts. I always disclaim these blog posts that I’m not an expert in these fields and that I’m happy to connect my readers with people who can properly address their questions and concerns. I overcome these challenges by educating myself and having the confidence to do so. I know most of the tricks up their sleeves and how to dispel a lot of myths. As a blogger I have to be professional and ethical as I represent a lot of brands, but I’m also representing myself and my family too. I could get snarky and mouthy, but I always remember that our words can heal and be life-giving or our words can be hurtful weapons – so I strive to abide my the former. Fighting fire with fire just doesn’t get anyone anywhere and if the naysayers keep coming at me with snark and negativity, in the end it makes them look like fools and discredits them. I’ve absolutely had to grow a thicker skin since I started agvocating, which is a good life lesson anyway, and I have learned that it’s okay to not address every single comment and it’s okay to delete comments that are just plain vulgar and destructive. I have been called a pawn or a shill for big ag, I have been called a bad mother, I have been called an irresponsible blogger for sharing “misinformation”, and most recently I have been called a “stalker” for responding to the misinformed tweets of an anti-GMO blogger. That’s okay because I have the confidence in myself and in what I blog about, and I don’t feel the need to fight with these people anymore to defend what I know to be true. I have also decided to not engage with anti-GMO activists anymore as their minds and their ideals won’t be changed and it’s not worth being put through the ringer and dealing with the stress it brings. This thoughtful card from AgMoreThanEver came at a much needed time! Simply answered – no. I strongly feel that if you cannot engage with people in a positive and respectful way, you shouldn’t attempt to agvocate. There’s no need to name-call or assume that people know anything about the agriculture industry, and that if they don’t they are ignorant and stupid, because so many don’t have a clue about anything in ag, and that’s okay. When we put our knowledge out there we must be accurate, accountable, and authentic, as I heard Cami Ryan recently shared in her presentation at Farm Tech, and I wholeheartedly agree. We must remember to agVOCATE and not to become an agTIVIST, there is a huge difference between being an advocate vs. an activist. Let us share our knowledge in agriculture, be proactive, respectfully dispel myths, avoid feuds, and just be positive. Share your story. I also have to update this to add that I have made some absolutely amazing friends, especially my fellow female ag bloggers, who are some of the most kind, funny, and passionate women I have ever ‘met’ in my life! Love to you all! Alright. I believe it is time to dust off the old soap box and step back on. Many organizations reporters and marketing programs recently have expressed opinions about what is the “ideal” regarding animal production in Canada. “Better Beef” from A&W, the W5 report regarding egg layer operations, PETA, HSUS throw around ideas and words intended to pluck at the strings of the consumer’s heart to show that they are better, that they care, that they are not the enemy while big business – agriculture – is trying to simply make an extra buck. Phrases such as environmentally friendly, sustainable, humane, antibiotic free are tossed around like so much feed in a pig barn. Although I group these organizations together, their underlining intent is often not the same. PETA and HSUS want to eliminate the use of animals altogether, A&W wants to drive sales, W5 well I’m not entirely sure why a “news” organization would publish such a one-sided sensationalized commentary other than to increase viewers. The common denominator is that they are all focused on currying the favour of society and the consumer at the expense of producers and livestock. Deep down my dirty little secret is that I truly don’t have a problem with a company creating a marketing campaign that targets the needs and wants of the consumer or when a news article provides a balanced article detailing the pitfalls of a production system. Where I do draw the line is when an organization does not support the Canadian producers that are purchasing their product, the people that have reliably supplied them with a safe healthy food product for decades. For example the A&W campaign that openly sourced product from suppliers outside of Canada. I suspect that had the lines of communication been open, Canadian beef producers would have happily agreed to provide whatever beef product A&W requested. However to imply that the beef industry is not willing to adapt or evolve or cannot supply what is needed is simply erroneous. Now, that brings me to the point of this story. Why are the lines of communication not open? Why are we not telling our story? Why are we not working with our consumers to identify new trends and supply that product? I am at a loss as to why livestock agriculture is so afraid to seek out the needs and opinions of its consumers. Is it because we are afraid that we will not stand up under scrutiny? Is it because we are afraid we will have to eat humble pie and acknowledge maybe we might have to change? Agriculture by its very nature is the epitomy of adaption and evolution. This should be something we in livestock agriculture are excitedly engaged in! So come on agriculture. Step up. Let’s figure out what consumers and society wants. If that means seeking out consumer’s opinions, and asking questions well then lets get asking! If that means changing then we may just have to change to meet their needs. I fear that if we do not, we (and therefore animals and society in general) are going to lose out because the misguided and misinformed may force us to go down the wrong path.